In this article, we’ll give you some tips for managing your iCloud storage so you can get the most of the space you have available. To check your iCloud settings and see what you are syncing and backing up, open up the Settings app on an iOS device, then tap on iCloud. Settings like Contacts, Calendars, Reminders, Safari, Notes, Passbook (on iPhone) and Photo Stream do not take up any of your storage space. It is a good idea to have these on, as it allows the content to be synced to another iOS device, icloud.com, or a computer. It is also a good idea to turn these on, because it allows you to quickly restore up-to-date versions of that data even if your iCloud and iTunes backups are out of date. Photo Stream doesn’t take up part of the iCloud storage space, but you are NOT able to access it on icloud.com. Photo Stream pushes any new pictures you take or import to your other devices for a total of thirty days. Photo Stream stores your last 1,000 pictures, which you can then save permanently to your other device. Now let’s discuss how to check your iCloud storage. Tap on Storage & Backup. Automatically back up your camera roll, accounts, documents and settings when this [iOS device] is plugged in, locked, and connected to Wi-Fi. If you scroll all the way down it will show you when the device was last backed up to iCloud. To determine the size of the backup files, press the Manage Storage button. 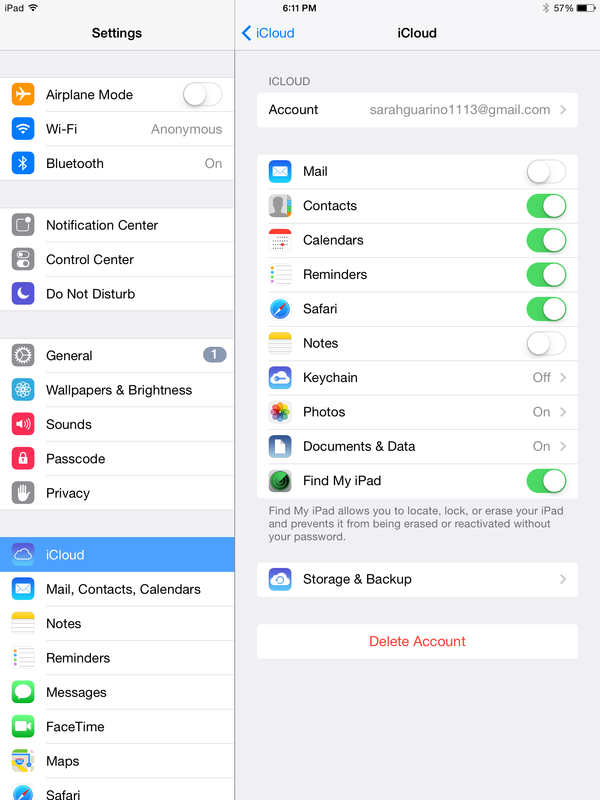 If you have multiple iOS devices backing up to iCloud, it will list all of them. It will also show you how much space your Documents & Data are taking up. Tapping on Pages, Numbers and Keynote will show you what files are saved in that app and how much space each document takes. Other apps like 1Password, iMovie, iPhoto and a lot of games will store data so that it will sync across all of the devices. If you are using a @mac.com, @me.com or @icloud.com email address it will show you how much space your Mail takes near the bottom of the screen. Note that in the screenshot above, my mail takes up 2.3 GB. This makes sense, as I have and been using my account for over ten years, have 2,700 emails in my inbox, have never deleted sent mail, and still have my original welcome to .Mac emails. For a majority of users, their mail size is typically a few MB. If you tap on one of the devices that is not the one you are currently using, all you will see is when the latest backup occurred, the backup size, and an option to delete the backup. If you tap on the device you are currently using, you will see when the latest backup occurred, the backup size, and the option to delete the backup. 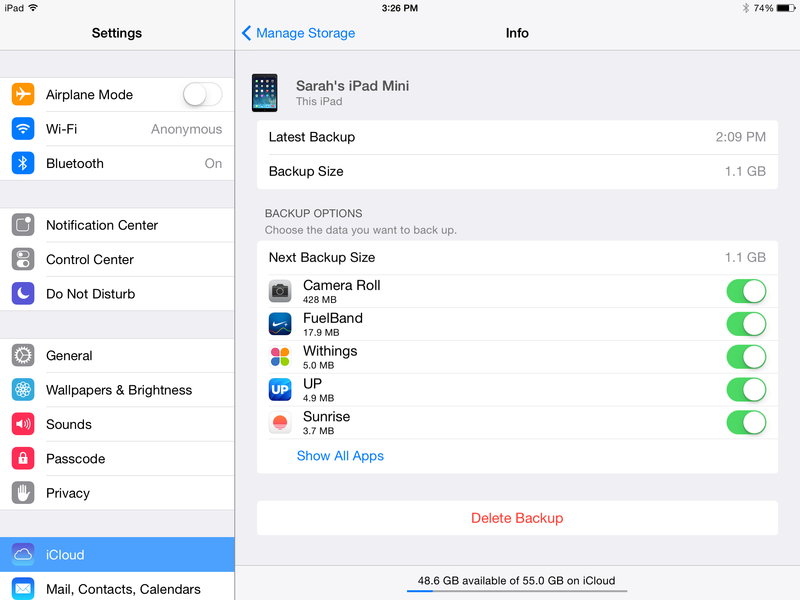 You’ll also have a set of options to decide what app data you want to backup to iCloud. Here it shows you what apps your device is backing up and how big the files for that app are. The majority of the apps are rather small, coming in at only a couple of MB or KB. Most of these files are so small and insignificant (in terms of storage, maybe not data) that turning each one off in the hopes of saving room in your iCloud is a waste of time. What is going to eat up the majority of the room is the Camera Roll. The Camera Roll is the place on your device where the pictures are saved after you take them or save them from other apps. If that number is close to 5 GB, you will have to make room so that iCloud can back up your device. Backing up your photos through iCloud is a good idea and it works well, but it isn’t as ideal as one would like it to be, since you cannot go into the backup file and take a few specific pictures out. If you have the Camera Roll backup setting enabled, it’s going to back up all of your photos, including any that you’ve already backed up to your computer or some other storage solution like Dropbox. If you then want to continue to use iCloud to back up your device, but can’t fit your photo library in the provided storage space, you may have to delete some photos. 1. Use Dropbox. The Dropbox application has a feature that allows you to automatically detect and upload new photos to your online storage, which is then synced through the Dropbox website and app to all of your other devices. Dropbox also recently changed their pricing to make this plan even more cost-effective. 2. Backup to iTunes. 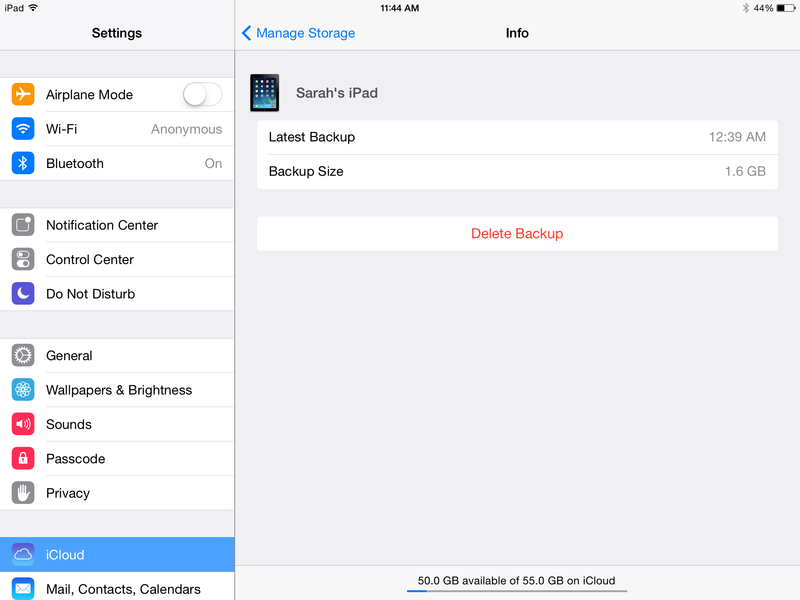 While you can still use iCloud for saving your other important data, doing a regular backup in iTunes on your computer will allow you to keep a second copy of that critical data as well as provide you with ample storage space for your photo library. 3. Purchase more iCloud storage space. 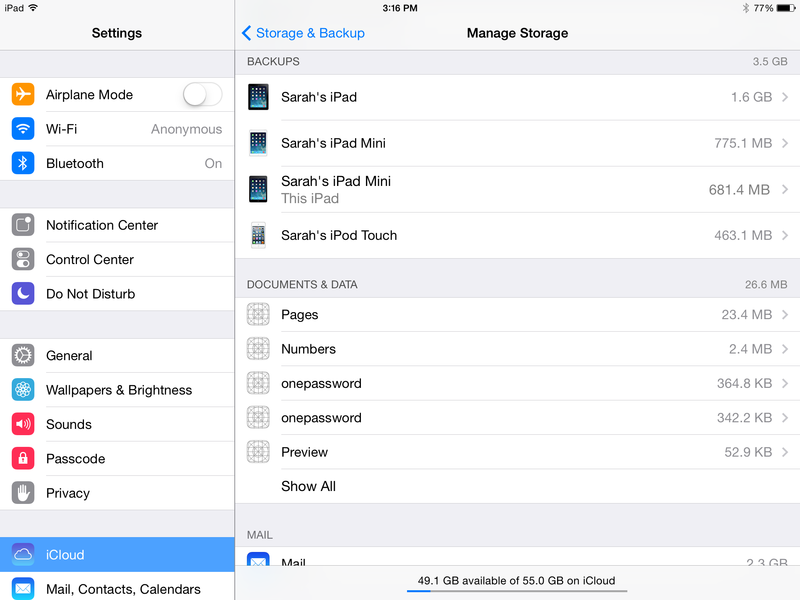 Apple sells larger iCloud storage plans for users who need more space. 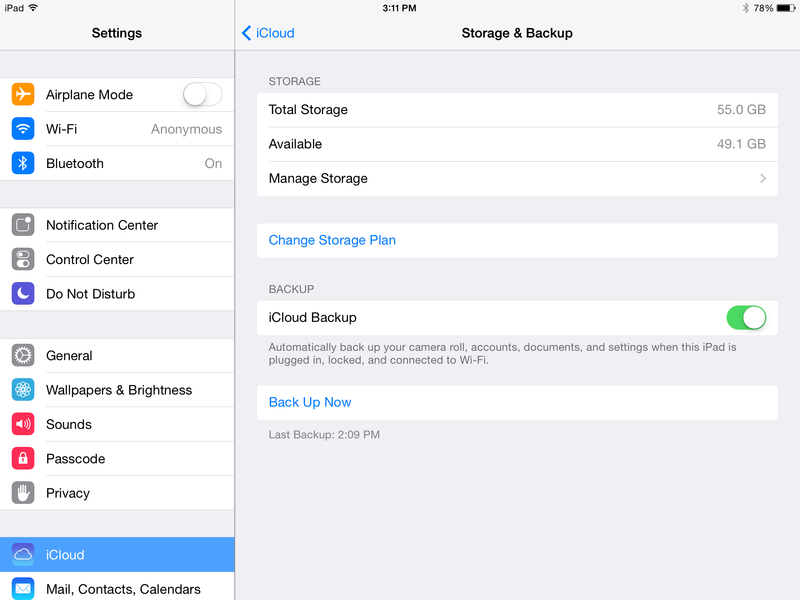 To upgrade, you can tap on the Change Storage Plan button on the iCloud settings screen. The iCloud packages are a yearly subscription. iCloud will charge the credit card or iTunes gift card you have on file associated with your Apple ID.